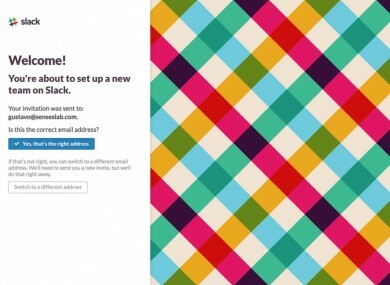 Everyone get ready for Slack. BILLION-DOLLAR WORKPLACE messaging startup Slack plans to hire 100 staff for its new European headquarters in Dublin. The San Francisco-based tech company, which was valued at $2.8 billion (€2.45 billion) on its latest fundraising effort, has already begun advertising for jobs in its first office to open outside North America. It will unveil its office in Dublin’s Digital Hub today as the startup continues its rapid-fire expansion, which includes recruiting customer service staff and account managers in the Irish arm of its operations over the next two years. Despite only launching its current service in February last year, the company said it boasts 750,000 daily active users and is the fastest business-to-business application in tech history. It provides a single, instant-messaging hub for work teams with customers including Airbnb, eBay and The New York Times. Slack was founded by Canadian Stewart Butterfield, one of the co-founders of photo-sharing site Flickr – which was bought out by Yahoo in 2005. In an interview with Fortune late last year, Butterfield said Slack’s growth had been “completely insane”. Earlier this year he flagged plans to expand the startup’s total workforce from 100 to 250 employees. Taoiseach Enda Kenny said he welcomed Slack to Ireland, “the digital hub of Europe”. By choosing Ireland as the location of its European HQ, it is reaffirming the reputation of Ireland as the location for young innovative technology companies,” he said. Email “One of the world's hottest startups has landed in Dublin - and they're hiring”. Feedback on “One of the world's hottest startups has landed in Dublin - and they're hiring”.